I made Greek Yogurt today ~ not that it’s hard, you just dump plain yogurt in a strainer lined with cheesecloth (or paper towels) for a few hours until the yogurt gets nice and thick. The only mistake I made was buying “All Natural” instead of “Fat Free” (I just wasn’t paying attention, I guess). I might still go to the store and buy Fat Free also and then mix the two. 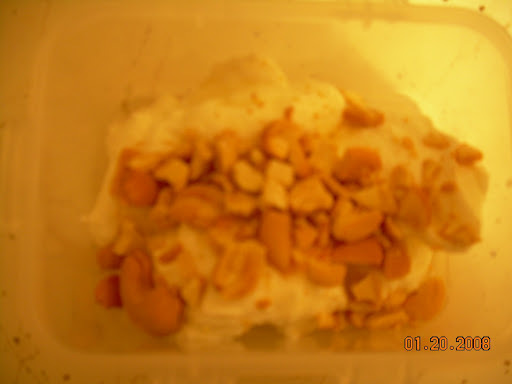 Anyway, I start P2 tomorrow, which means I can have my favorite dessert ~ Greek Yogurt w/ Agave Nectar & Cashews. I got this recipe from Kalyn’s blog and I absolutely love it! Run a knife around the outside edge of the yogurt inside the container, then invert container over a plate so yogurt comes out upside-down. Drizzle amber agave nectar over yogurt, then sprinkle with nuts. Serve immediately. Per Serving (excluding unknown items): 339 Calories; 19g Fat (46.9% calories from fat); 12g Protein; 35g Carbohydrate; 2g Dietary Fiber; 3mg Cholesterol; 131mg Sodium. Exchanges: 1/2 Grain(Starch); 0 Lean Meat; 1 Non-Fat Milk; 3 1/2 Fat; 1 Other Carbohydrates. Comfy in the Kitchen — Step by step, you’ll get there yet!